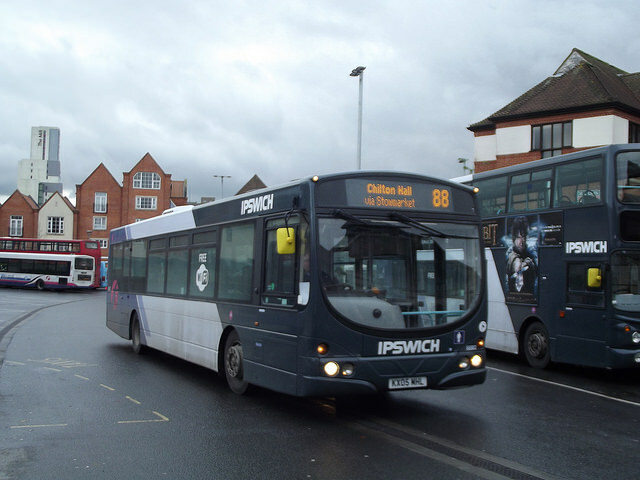 I have received confirmation that the 3 Ipswich B7rle's transferred to Norwich today were 66976, 66978 & 66980, not 66980/3/4 as reported yesterday. My apologies for the inaccuracy, which was contained in an official First document. And on that note I bid you all farewell. It's been fun but the fun has stopped. I will leave the blog open so you can look at the archives, and who knows I may decide or let myself be persuaded to restart sometime in the future. Thanks for reading, and I hope those TRUE friends I have made through the blog will continue to be friends. This week I decided to ease back on news gathering. I started the blog to reflect my own experiences and opinions, and over the last few months I have been rather sucked in to the blog paparazzi culture. No more, and unless I have first hand news I won't be publishing it. So naturally over the last 24 hours there has been a torrent of news falling into my lap! We start with First, and I must thank my contact for supplying and clarifying all of the following. It is going to be a busy few weeks with vehicles transfers and cascades happening. 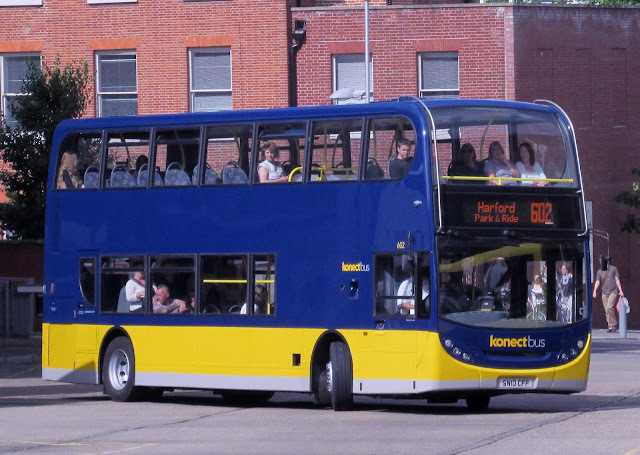 It has been widely reported that 3 more B7rle's are transferring fromm Ipswich to Norwich this weekend. 66980/3/4 are the confirmed vehicles concerned, but what hasn't been known until now is that two will be repainted into Purple Line livery, thus completing the Purple Line repaint programme unless the little Darts are repainted of course, and rather surprisingly the third to be repainted into Turquoise Line livery. This will see the withdrawal of 3 of the B7l's of which more as we go on. Of course we are still waiting for 66982 to emerge with her Yellow front! Two more B7l's will be withdrawn due to PVR requirement reducing, and another two withdrawn being replaced by two President B7tl's transferring from Great Yarmouth, so if my maths is correct that is 7 bum numbing buses off the streets of Norwich in the next 3 weeks. However it doesn't end there. Over at Yarmouth two of the Olympians are coming off the road this weekend and are to be kept in reserve in usuable condition. The peak Bernard Matthews season is coing, and it is pretty likely the Ollies will be back out in service at some point, probably on the 8's as there are issues with them on Bernies, which is why they haven't been seen much on them recently. Also one of the B9tl Geminis is to transfer to Lowestoft and Jersey Dart 43863 is to join the withdrawn Norwiich B7l's by cascading to Bristol, where I have heard whispers they may move on down to Cornwall, although that is yet to be confirmed. Indeed ALL the Jersey Darts will soon be leaving FEC, although as yet there are no confirmed replacements. No tears shed there! Coming to Norwich in October/Novemeber are 11 full length Streetliites. Of those 7 are to be painted into Green Line livery, with the other 4 painted in generic Urban livery. This will obviously see the end of more B7l's. 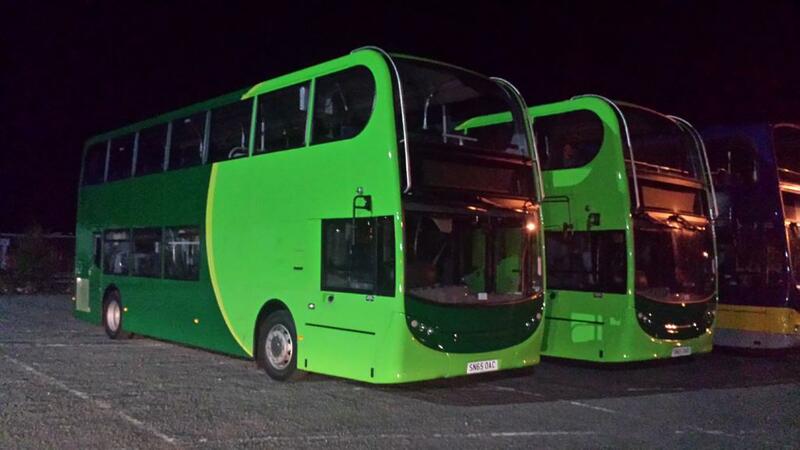 There are also two more Geminis on the way, an 03 reg and an 08 reg from Green Line in Southampton, so not the ones originally expected. Their use has yet to be determined. Finally from First confirmation that the last ever Olympian built 34110 has been saved and should be collected in the next couple of weeks for preservation. Can't say how pleased I am about that and I'll give more details when I have them. Parts have been donated from the other withdrawn Ollies at GY and they are all to be collected for scrap in the near future. Moving onto Anglian and I received news yesterday that long serving Optare Excel 229 is to be withdrawn by Tuesday at the latest. This is because all 5 Versas have now transferred back from Konect, the last one arriving yesterday. 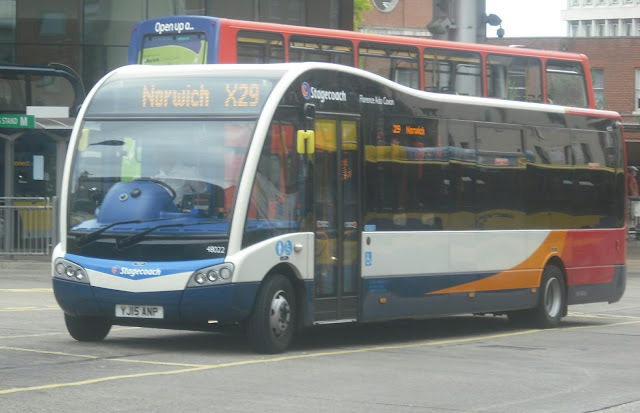 Also from Anglian I can report that of the Streetlites recently taken out of service (there were only ever 4 of them) only MX60 BWJ has been painted white, with MX60 BWH currently being painted. Thanks, as always to my contact at Anglian for the updates. I'm hoping for more news re the Streetlites next week. 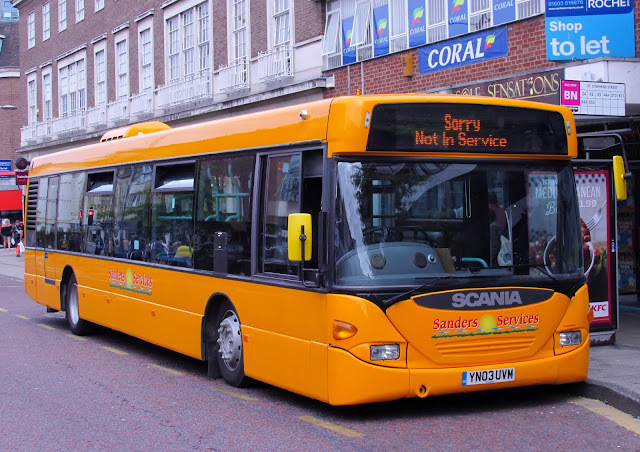 As reported on Ipswich Bus Blog Galloways have taken two 15 reg Optare Solo SR's on loan until their own new ones are delivered. 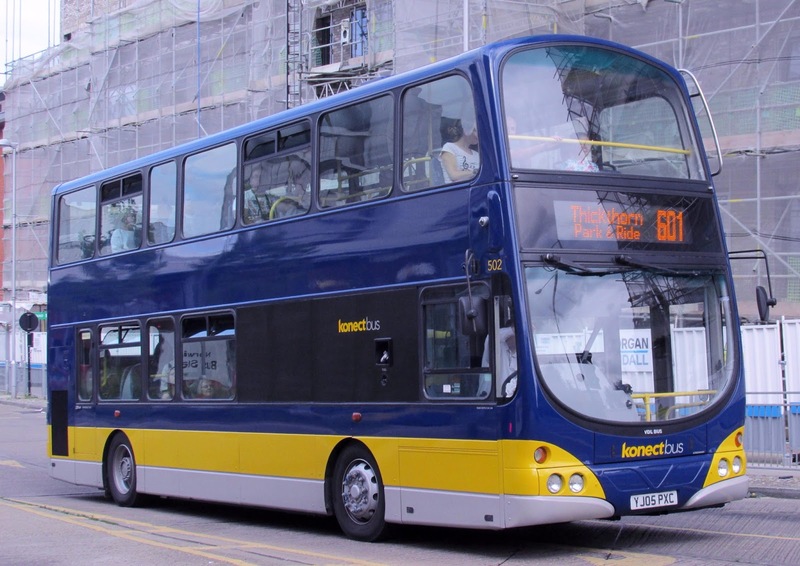 KX15 GLN has been given fleet number 352, and KX15 GLK 353. Also from Galloways the on loan Stephensons Olympian has had all Stephensons logos removed but will retain the basic livery. 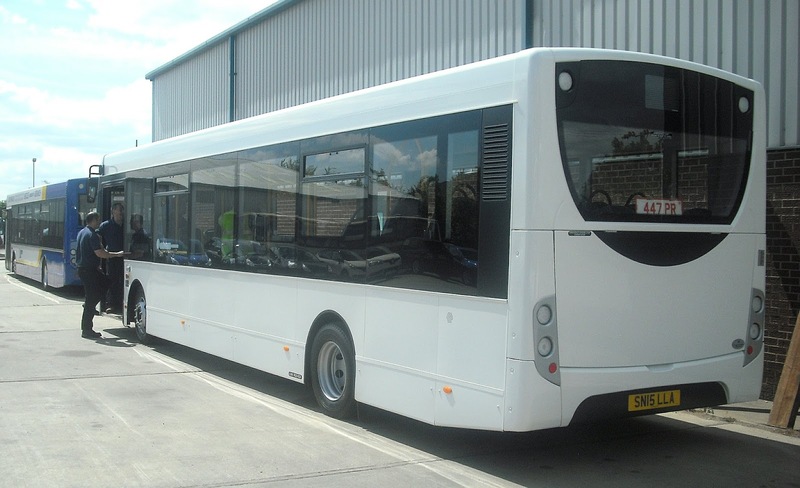 Also on order for next year are two Van Hool TX16 coaches to replace the 11 reg Van Hool's 296 and 297. My grateful thanks to David Green for his continued and regular updates. Why Are Cuts Always The First Resort? 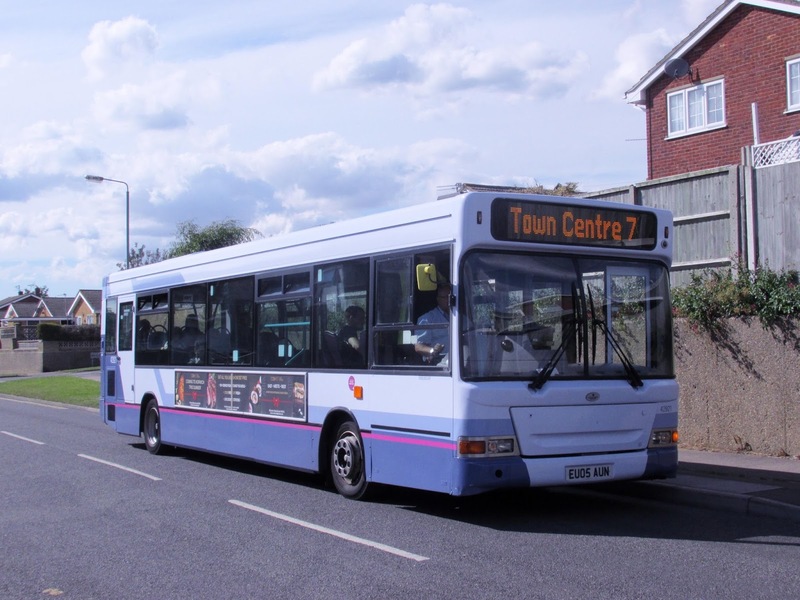 As regular readers will know my nearest First bus route is the 64, which runs between Ipswich and Aldeburgh via Woodbridge, Saxmundham and Leiston. For 5 years while I lived in Wickham Market it was my main route. I still use it regularly to get to and from Ipwich, and particularly Wickham Market, as I still have many friends there, in particular an elderly lady who I became close friends with when we were both nursing an old friend of mine in his last days. I try to visit her at least once a week if I can. 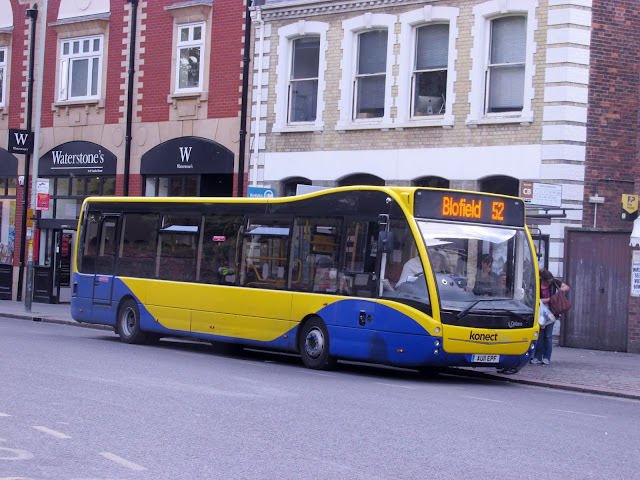 That is now going to prove extremely difficult as yet again First are cutting the service between Leiston and Melton, this time by 38%, reducing the service from 13 buses a day to 8. Now to put this into perspective I moved to Wickham Market October 2008. I'm grateful to Clive Nixon who has found copies of the relevant timetables in Ipswich Transport Museum to help me confirm my memories of the bus service at that time - remember less than 7 years ago. It's not a long time, however a lot has happened to the bus service in that time, and none of it positive. One of the main boxes that was ticked when I decided to make Wickham Masrket my new home was the bus service. Not only was there an hourly service on the 64 between Ipswich and Aldeburgh but there was also an hourly service on the 63 between Ipswich and Framlingham (normally operated by lovely old Ollies) giving Wickham Market two buses an hour. Evenings and Sunday there was a two hourly service, and a last service of 2305 from Ipswich 7 days a week. I was on that late bus at least twice a week, including Sundays, as I was playing pool for an Ipswich pub at the time. It was a great service, my only gripe being the return fare to Woodbrdge was the same as a return to Ipswich, which I couldn't then, and still can't work out. 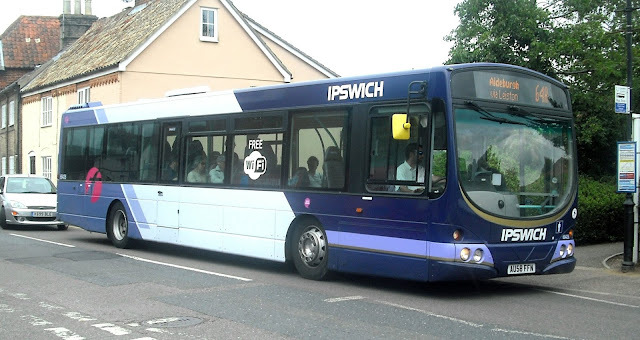 In short on a weekday there were 25 buses each way between Ipswich and Wickham Market - I could even get to hospital in West Sussex and back without having to trouble friends for lifts. Then things started going pear shaped. First of all the 63 was reduced to two hourly, which had the effect of pushng Framlingham passengers onto the cross country 118/119. So you didn't get the same number of passengers on half the buses. You got emptier buses so the inevitible happened and the Framlingham service was scrapped completely bar one school journey a day. Suffolk County Council stepped in providing a 3 times a day Mon - Fri minibus service between Framlingham and Woodbridge which most people still don't realise exists. Then the austerity cuts were announced. 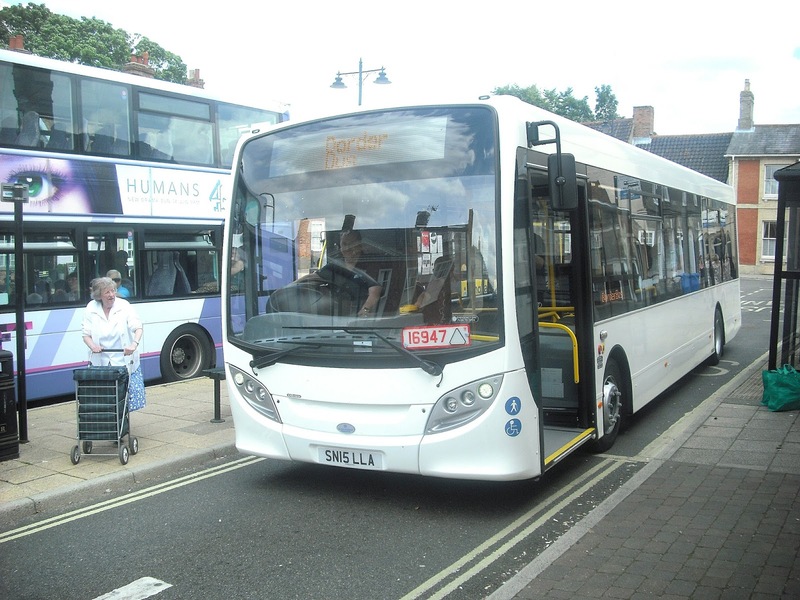 The very first bus service to go was the evening and Sunday service to Wickham Market and Rendlesham. At a stroke the last bus was brought forward 5 hours on weekdays and my pool career summarily curtailed. All of a sudden what had been 25 buses a day was 13. Last year a Sunday service was restored between Ipswich and Melton - WHY MELTON??? Melton has a station - neither Wickham Market or Rendlesham do! Well Wickham Market has one in name but it is 3 miles away from the village down an unlit road with no pavements. So the communities who needed the bus most lost the most, and come Tuesday they will lose even more. 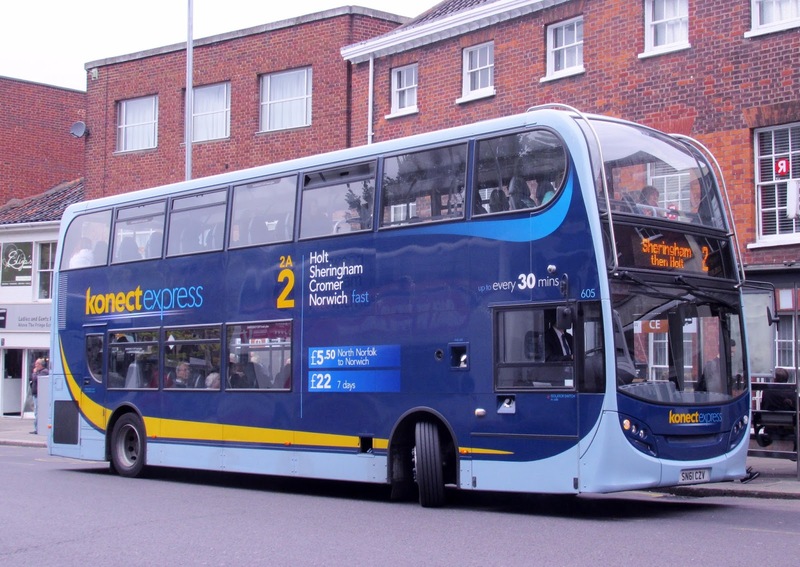 In late 2011 Anglian started a service between Saxmundham and Ipswich, which was quicker and really gaining in popularity when Go-ahead took over and their first act was to axe the Ipswich services. The 164 disappeared after 6 months as quickly as it appeared. Now before I continue it must be noted that First are cutting services and closing depots countrywide. Plymouth, Hereford, and Braintree depots are closing for example, and many services elsewhere are suffering cuts. I have spoken to local management and they are just following orders - this is coming from Head Office who obviously know everything about local needs and services. I have been holding this under my hat for a long time now, but I interviewed David Squire before he left as Managing Director of First Eastern Counties, and he gave an extremely strong hint that he was joining Rotala as he would rather be with a company looking to expand as opposed to a company looking to make cuts. I doubt he will be the only one within First to do that. So I am not having a go at local management here. The managers I have spoken to recently share my views and it would appear they are having to operate with one arm tied behind their backs. So back to the 64. If you live in Leiston you will actually have a better service to Ipswich than you did in 2008 thanks to the re-routing of the 65, although if you shop in Saxmundham you'll only have one bus every two hours so I urge you to use the 521 as much as possible - it is reliable, an alternative and yes only every three hours but you may find the length of time in Saxmundham is better than the hour and 50 mins you'll have to wait for a 64 back. However Leiston is the exception. If you live in Aldeburgh, Knodishall, Snape, Tunstall, Rendlesham, Eye, Saxmundham, Stratford St Andrew, Glenham, Wickham Market or Ufford then you are down by 38%. 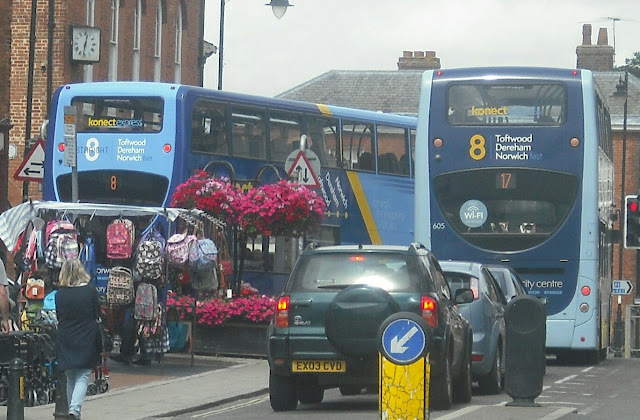 How ironic that in 2008 there were 8 buses on a Sunday between Ipswich and Wickham Market - the same number as there will be on a weekday from Tuesday. So why is this happening? Well First claim that passenger figures are low on the sections of route being cut. They claim people from Saxmundham would rather get the train to Ipswich as it is faster. The train also a lot more expensive, but then of course trains run later than the buses. And on Sundays. Oh yes and they connect with other services. As of Tuesday the 64 will not connect with any of the once or twice a day rural services that it currently does - hence my problems visiting my friend in Wickham Market, although I understand that will be corrected for the next timetable change, indeed I have been asked to supply the connections that need to be restored. There are many - the 64 doesnt even connect with the trains now for passengers from Aldeburgh or Lesiton. Oh they don't connect in Woodbridge either. When I saw the timetable my first reaction was that First were trying to drive as many people off the route as possible so they could eventually axe it. I am assured that isn't the case, but this Summer 5 buses have left Ipswich for Norwich - not the sign of an expanding depot. So why don't more people get the 64 - incidentally plenty do especially between Leiston and Saxmundham - and what could be done rather than cutting services? This Summer has seen £1 fares on the 99 in Kessingland competing with Anglian, and £1 fares on the 53 in Ipswich competing with Ipswich Buses. In the nearly 9 years I have lived in Suffolk I haven't seen a single fares promotion on the rural routes. Lots of fares rises but no promotions. Why not? These days you have got to give people a reason to get the bus. 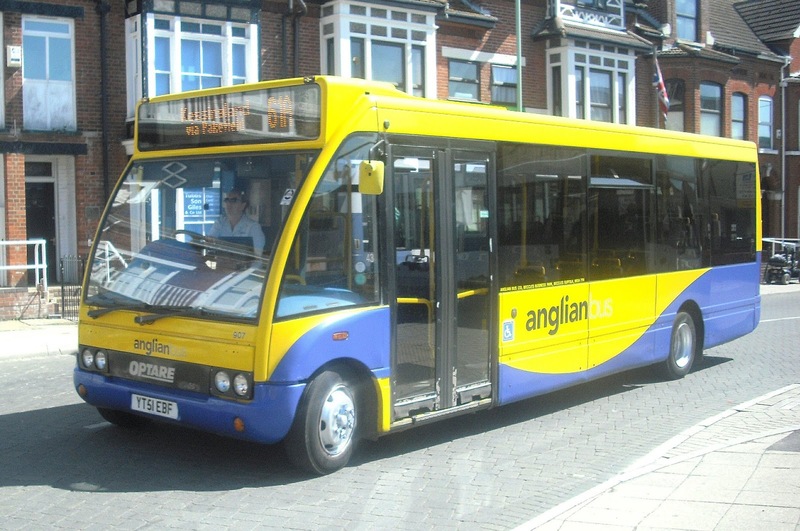 Had Anglian done a major leaflet drop of the area when they started the 164 offering a free journey to sample the service it would have taken off in a huge way. Instead people just looked at the buses wondering what they were and not wanting to get on them - remember country people and change! So we have the lack of financial incentive despite being cheaper than the trains. Journey times are also too long. Believe me passengers travelling from Aldeburgh and Leiston etc don't want to go round every housing estate there is in Woodbridge, or pick up every shopping trolley there is between Ipswich Hospital and the town who should be on the 66. Years ago there was a shuttle bus operating around the estates which linked up with the main service at Woodbridge. Restoring this would slash journey times from the furthest part of the route, as would making the route limited stop from Ipswich Hospital, and morning and afternoon express services to cater for workers and students travelling to Ipswich. Give them a reason to drop the train. First are doing it from Felixstowe after all. The last point I have is one that has always been a mystery to me - and that is why do bus services go to outposts and back, rather than via the outposts to somewhere else. Saxmundham is good for an hour's shopping and that's it. Leiston, well is Leiston, and Aldeburgh just doesn't really attract those travelling by bus. So yes, buses may leave Ipswich full and arrive in Ipswich full, but by time they get to Aldeburgh there's hardly anyone left. So why isn't Saxmundham used as a hub (as suggested by ESTA a couple of years ago) and the 65 extend from Aldeburgh and Leiston with the 64 linking up with it but continuing to Southwold. I know there is demand for an Aldeburgh - Southwold link and it would open Southwold up to a new market of people on the Ipswich side. 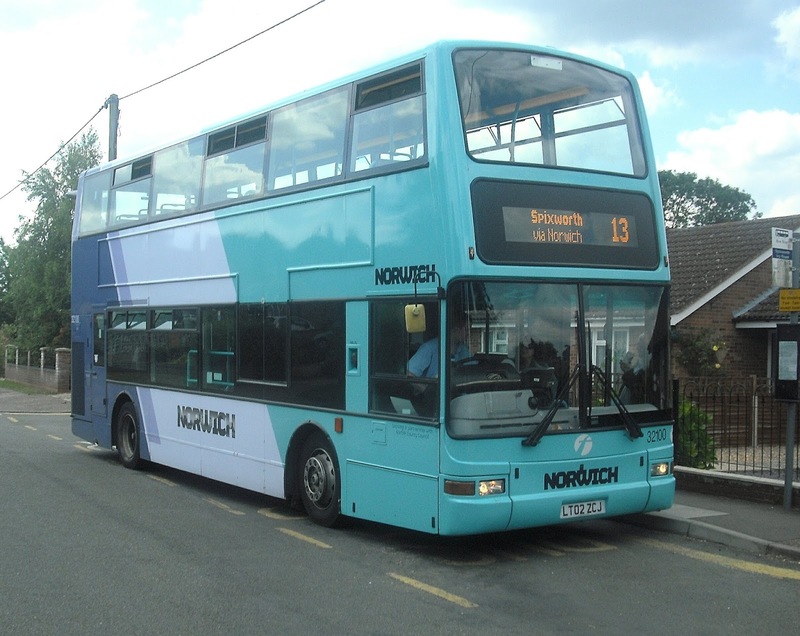 Extend the 99 to Southwold again and hey presto the Ipswich/Lowestoft service is back! You cannot expect people just to get the bus these days, unless like me they have no choice. But no - it's much easier to cut services as opposed to trying something new and innovative. 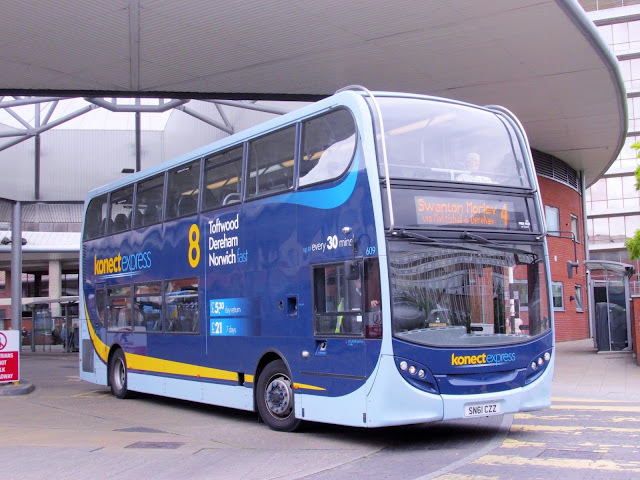 The only new services First have launched recently (X7 excluded) have been on routes already operated on by competitors. That's not enterprise or progress - it's poaching and copying, and is the perfect argument for re-regulation. It is interesting to note that First are cutting services in Norwich. But hang on a moment. Sanders are taking over the route in Stalham to replace the 12. 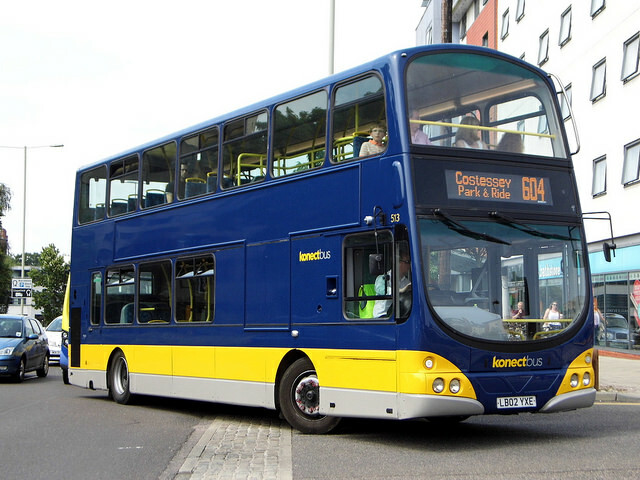 Konect are putting on extra 53's to replace the 14, and First have been forced to backtrack and continue a limited nght service on the 25 to the University. But there's more. Stagecaoch have taken over First's routes in Plymouth, and in Braintree it has been announced that not only are Stephenson's going to take over some of the routes abandoned by First Essex they are also going to open a depot there and are appealing for First drivers at Braintree to join them. If these routes were so unprofitabe, or lacked any potential would these companies be taking over so readily? However salvation for passengers on the 64/65 corridor looks bleak. Other operators are refusing to consider the route. Suffolk County Council have ruled out any sponsoring of the route - hardly surprising really as public transport is so low on their list of priorities as to be negligible. No point keeping day centres open, Smurf, if there's no public transport to get there in the first place. I was informed today even Suffolk Links, my lifeline, has been told to make cuts. Cuts mean a poorer service, no matter what spin is put on it. The phrase "greater efficiency" is a death knell. But hey it's not all bad news. 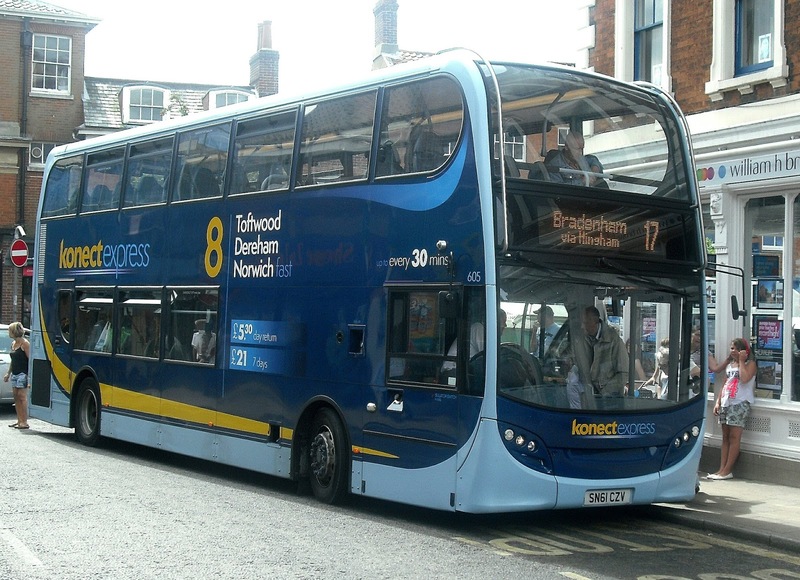 Only 8 days to go and car drivers in the Norwich area get 18 brand new buses to take them into the fair City with wifi, idiot proof on board screens telling them they have arrived and USB chargers. Of course you cannot access these services if you don't drive, or know someone who does. WHAT ABOUT ORDINARY BUS PASSENGERS? 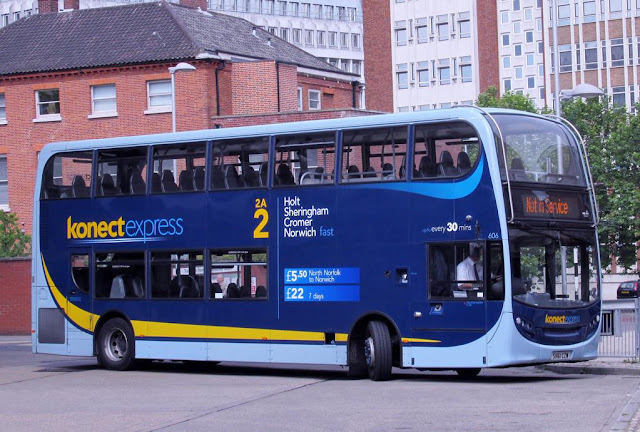 If the councils gave them as much priority as they do pandering to car drivers (don't bother telling me Norwich P&R is now commercial - I know) then we would have such a decent public transport system that P&R would be unnecesary. Allow the councils to charge £30 a year for concessionary passes and use that money to subsidise loss making services. It could be done if there was enough desire to do it, and less apathy at high levels. When are top management going to start looking for reasons for, rsther than reasons against. So are First right, or are they letting down their loyal and dependent customers by not trying to save services with innovation before simply cutting them? Shouldn't cutting be the last resort not the First? 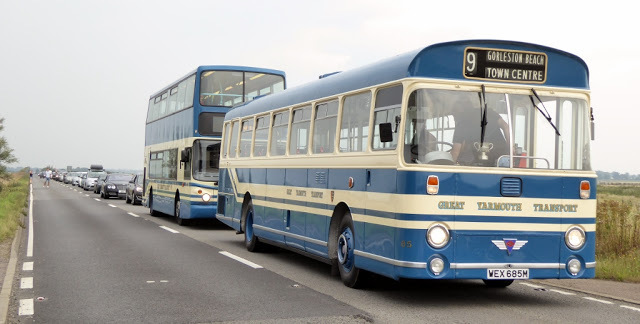 Sometimes video is better than pictures, and courtesy of Tim Miller I can bring you a video of some of the activities on Sunday involving the Great Yarmouth Transport duo 59 and 85, with a couple of cameo appearances from VA479 to appease out Ipswich brethren! Many thanks, Tim, and somehow you have managed to disguise the fact there was a mighty wind blowing! So who in their right mind would get up early on a Sunday morning, sacrifice the comfy viewing of a Chelsea match, and spend the day in a field in a howling gale talking to a load of old farts about buses. Erm me as it happens. 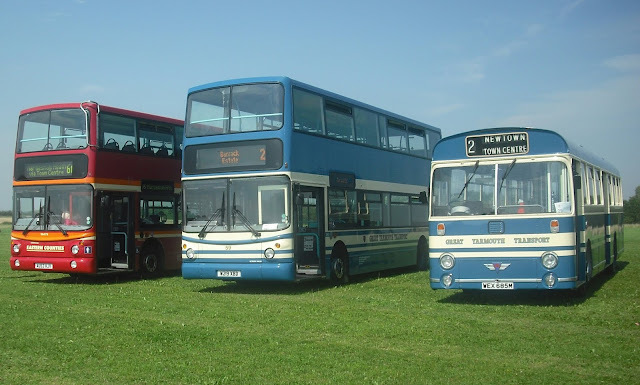 Yesterday as you'll know unless you've been living in a cave was the 4th Old Buckenham Bus Rally. The predicted washout didn't occur, instead a strong wind persisted all day, but us transport enthusiasts are a hardy lot and a bit of wind is nothing. There was a turnout of around 21 vehicles, including 3 Routemasters, 3 from various First depots, my favourite coach in the region (Fareline's superb Jonckherre bodied B10M), some blue and white thingy and a bus that declared it most certainly wasn't a Routemaster. "I'm not Spartacus"! But that wasn't my reason for missing the Chelsea match. The whole reason for going to these events is to catch up with friends, annoy enemies just by being there, and take the mickey out of Chris Speed. It's fair to say I concentrated on talk and not taking pictures as I knew there would be ample opportunity to view them elsewhere. So just a couple were taken, all involving my base for the day, the rather superb Yarmouth Transport Swift 85, owned by Chris and Danny who have kept it feeling like a bus and not a museum exhibit. As others have mentioned these are days to catch up with everyone and like an Oscar acceptance speech I'm going to mention everyone, so Tim, who drove virtually the width of Suffolk to get me there thanks buddy, Chris, Danny, Grahame, Clive, Sam, Cameron, Jamie, Zak, Harry, Colin, Joe, Des, Luke it was a pleasure to see you all and have a good gossip. It was a shame Roy, John and Alex couldn't make it but there's always next year. A special mention must go to Willow, who kept me so engrossed in seriously good conversation I hardly noticed the ride to Attleborough and back on 85! Old farts? Yup, and I'm a fully paid up member! 85, as it happens was voted Best in Show, beating a Border Terrier and a Chihauhua, and a good day was had by all. However it would seem that fame is getting to 85's head. I am indebted to Zak Nelson for allowing me to use this picture he took whilst on the way back to Yarmouth, which appears to show 85 and 59 holding up the entire Acle Straight while holding an impromptu photo shoot. You can even see the trophy in the windscreen. Bloody celebrities holding up the peasants! 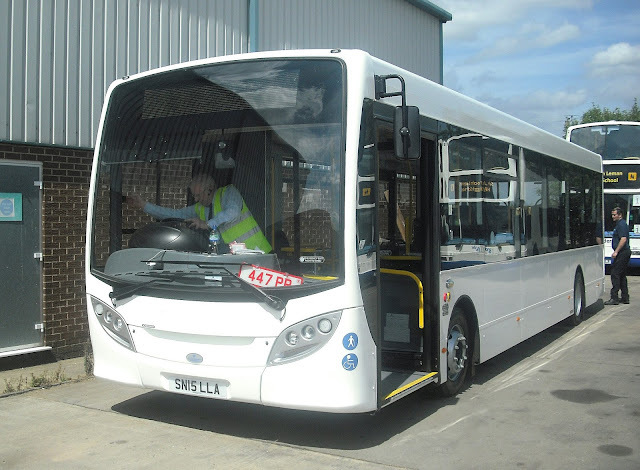 Noted in today's registrations on the VOSA website is a new route for Kings Lynn based Lynx. The 36 will run in two sections, from Hunstanton to Wells-Next-The-Sea via Brancaster and Burnham Market, and from Wells to Sheringham via Blakeney and Weybourne. The service is daily but as yet frequencies are unknown. One can only assume this is to provide competition to Stagecoach's Coasthopper Service. 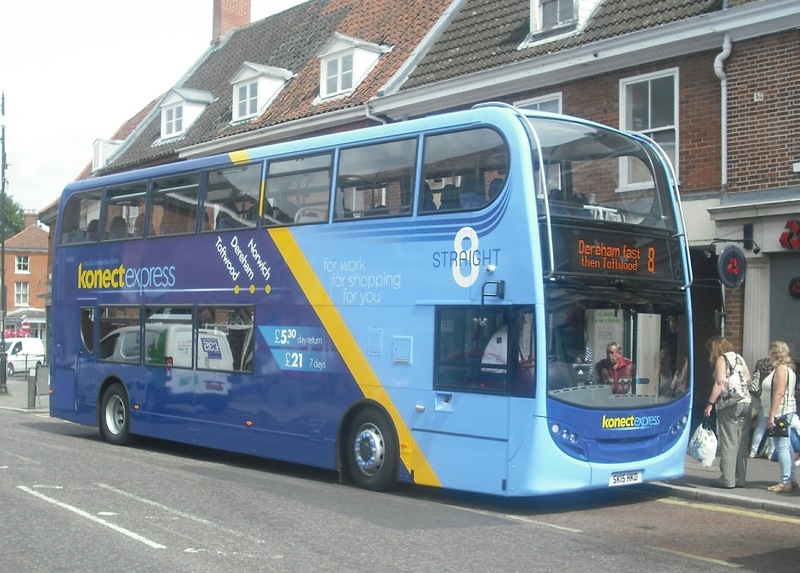 There are also changes to Lynx's established 35 service between Kings Lynn and Hunstanton, with timetable, route and stopping places all being altered. All these changes come into operation on 12th October. Coincidentally (or not) Coasthopper's Winter timetable comes into effect the same day. Also registered today were timetable changes to Anglian's 7/61 group of services, to start from 11th October. I have a feeling there will be more activity from Anglian in the coming days. Thanks to my man at Konect I can bring you the first independent photo of the first two Enviro 400's for the Norwich Park & Ride starting on September 7th. Taken last night SN65 OAC and OAB look quite good gleaming in the dark. 2 down 16 to go! SN65 OAC and OAB in the Dereham night. E I E I Ooooooh! I had to go down to Sussex yesterday for yet another eye check up, and to say I had a day of contrasting buses is an understatement. I got my usual Borismaster fix - have I mentioned I rather like them - but also tried out two of the more unique vehicles running around in London. However before we get to that I have an apology to make. I would like to make a full and public apology to all Plaxton Presidents, E400's, E200's, and any other vehicle I have criticised for being uncomfortable or rattly this year. Compared to the Metrobus Scania Omnidekka I had the misfortune to travel on yesterday you are all quiet, smooth, comfortable and a joy to travel on. There are not enough negative words in the english language to adequately desribe how awful this Omnidekka was. Suffice it to say that was arguably my worst bus journey this millenium. I expect it will be transferred to East Anglia soon! 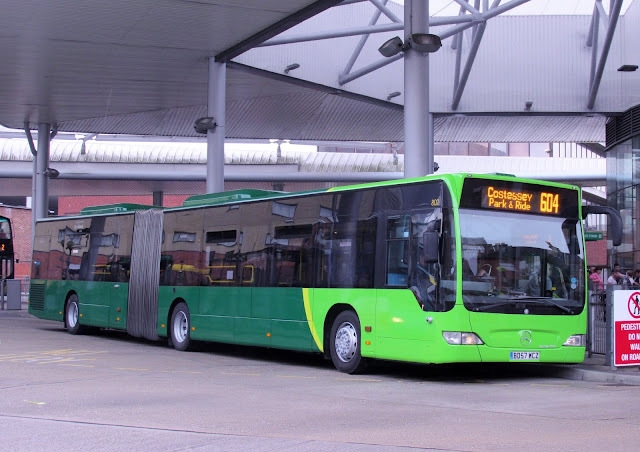 On that subject Robert Apppleton has sent me some pics of the ex Metrobus Omnidekkas now at Chambers and Hedingham and I'll be posting them tomorrow. So let's move on to nicer things. 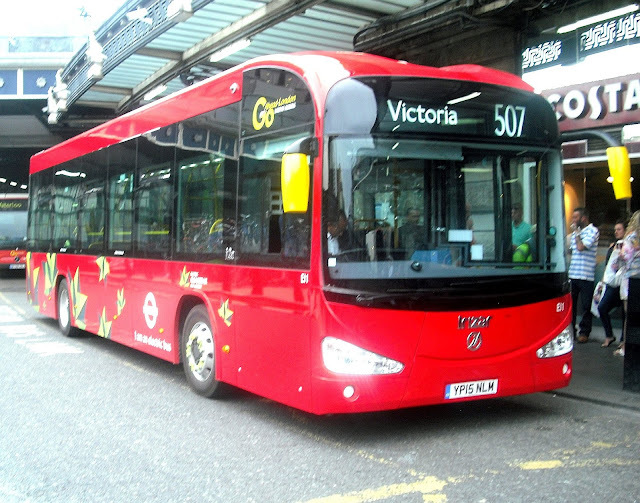 Last year I rode and reviewed the Chinese built Build Your Dreams electric buses on trial in London, operating on the 507 between Waterloo and Victoria. My views weren't exactly glowing (see here). Yesterday I luckily, thanks to the proficiency of my hospital, had a couple of bours to kill in London and lo and behold waiting at Vicroria was one of the Iriza elecric buses currently on trial at the same garage and on the same route. An opportunity not to be missed. If the bus is rare to have a chat with a London bus driver is even rarer! However the chap driving was extremely friendly and told me straightaway the Irizar was in a different league to the BYD and much more pleasant to drive. He was right. In fact the Irizar is everything the BYD wasn't. It is very quiet, except for a noise that I think was coming from the back axle when cruising. However I'm being a little churlish. 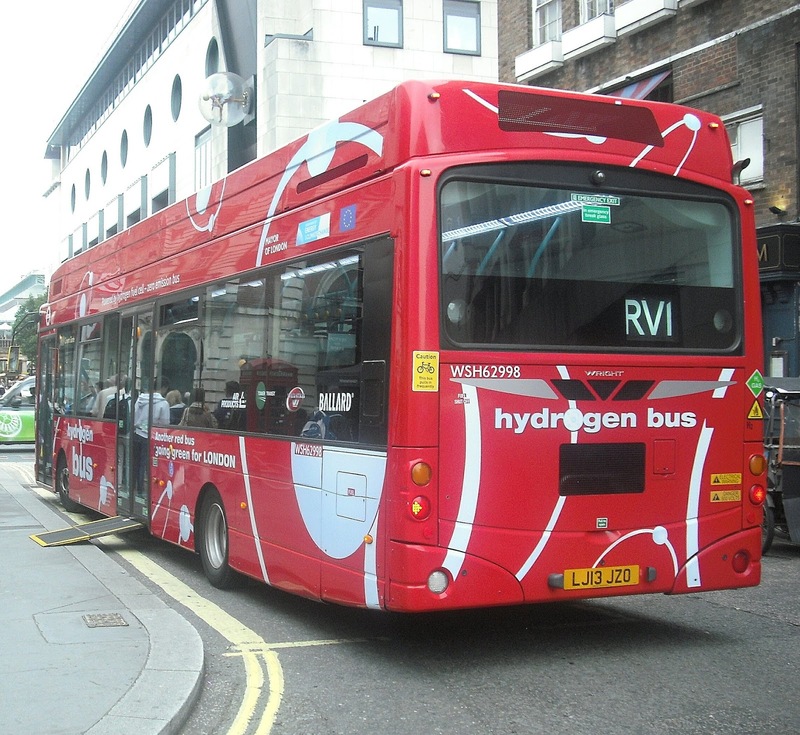 Unlike hybrids when the electric motor cuts out at bus stops or traffic lights there is no judder. The bus pulls away silently, quickly and smoothly with no pause or judder when the motor cuts back in. It sounds rather like a very quiet tube train and I loved it. Don't be surprised to see more of these coming to London soon. I must apologised for the quality of some of the pics - it was not good light yesterday and despite some tinkering this is the best I can get! Anyway I walked onto Waterloo Bridge to head in the general direction of Liverpool St and realised that the RV1 stopped at the same stop. 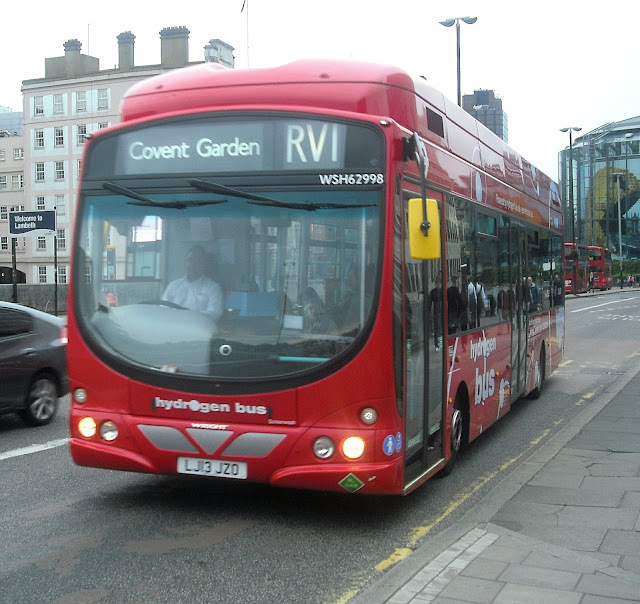 I have absolutely no idea what RV stands for, unless it's River, as the route runs from Covent Garden to Tower Gateway in Docklands. The reason I was pleased to have stumbled on the route was that earlier in the day en route from Liverpool St to Victoria I had spotted a hydrogen bus on the RV1, and as luck would have it the first RV1 to turn up on Waterloo Bridge was the very bus. LJ13 JZO is a Wright Pulsar bodied Hydrogen bus that has actually been around a couple of years now. Like the Irizar this bus is very quiet, although in my short journey I didn't find it as smooth. However, to be fair I was standing up not sitting as it was packed. There was time to notice, though, that the acceleration was very impressive. 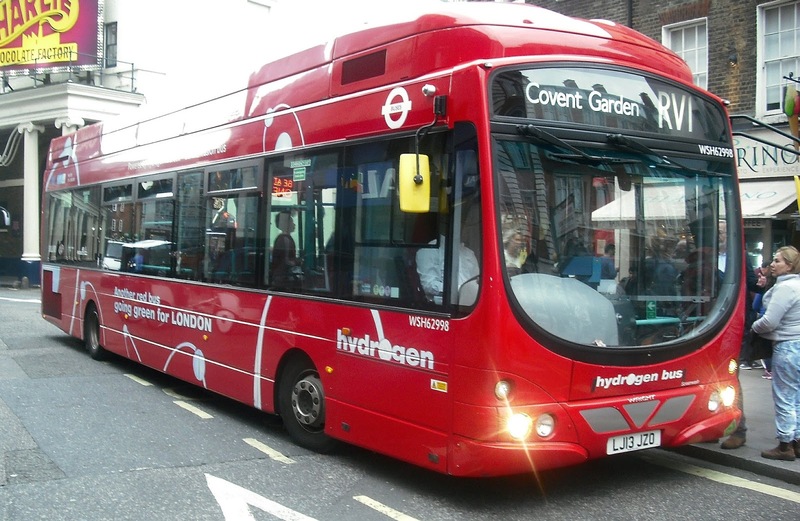 I think a longer ride is needed to really compare it fairly, but I simply can't understand why the emissions obsessed TfL haven't gone further down the hydrgen/gas bus road. However it was good to get on both those rare buses in the space of an hour. City v Country - Are They The Same? Well clearly not, anyone will tell you that. There's no such thing as a village McDonald's, and you don't see many combine harvesters in St Steven's St in Norwich. But they are just superficial differences. The real differences between city and rural life are a little more subtle, and having grown up in a Kent village, lived in London and now a Suffolk outpost I know the best and worst aspects of both ways of life. Hang on in here - this really is leading somewhere. Hands up those of you who live in a town or city who know 10 of your neighbours - I mean really know them to the extent you'd investgate if you didn't notice them on their usual routine, or notice the bins hadn't been put out etc. I lived in a Kent coastal town for 5 years and never met my neighbours once. When I've lived in towns I've known very few people. However in my home village down in Kent, and particularly when I moved to Wickham Market it took some getting used to when total strangers started saying hello and being friendly. That does NOT happen in Battersea! City folks call it being nosey. Villagers call it looking out for each other. In the country spontaneity is less readily available. If you run out of milk there isn't a Tesco Express down the road - you hope and pray the village shop (which charges 8 times more than Tesco) is still open at 5.30pm. You make sure you fill up with petrol on the way home as the nearest petrol station is 8 miles away. You might have 2 or 3 buses a day if you're lucky (I have 4 a week). Planning ahead is a necessity. But in the majorty of villages everyone knows everyone else to an extent. In fact people born and bred in the country know everyone in neighbouring villages too. There is far more sense of community, and that applies to public transport too, buses in particular. One thing country people like is familiarity. If something or someone is good they want to stick to it. I am still getting emails from people who want a bus service restored that was withdrawn over two years ago - but not just the service the drivers too. I know how they feel. We have a regular driver on our little 196 that comes through here 4 times a week. He is quite superb. At first, being Romanian he could barely speak a word of english, but even then you could time your watch by him. Now his english is greatly improved - enough to have a joke with - and you can still time your watch by him. Two mnutes late and I think something has gone badly wrong! All the old girls love him as he is only too happy to lift shopping trolleys on and off the bus, and stop outside front doors. He is not the only one like that. When Anglian scrapped the 62 earlier this year there was a lot of disappointment at the route going, but also a lot of sadness from passengers that they wouldn't see their regular driver again. Put quite simply on country routes the bus and the driver become part of the community as they are such a vital link to some people. This doesn't happen in big cities where buses are every 10 minutes. The country love of familiarity extends to those supplying services. Change is almost resented. So you would have thought it would be folly to attempt to run a country bus depot the same as a London depot. Surely that couldn't work could it? Well that is exactly what Go-ahead have been trying to do at Anglian for the last few months and in my personal opinion - and remember this blog is only MY personal opinion - it could spell disaster. 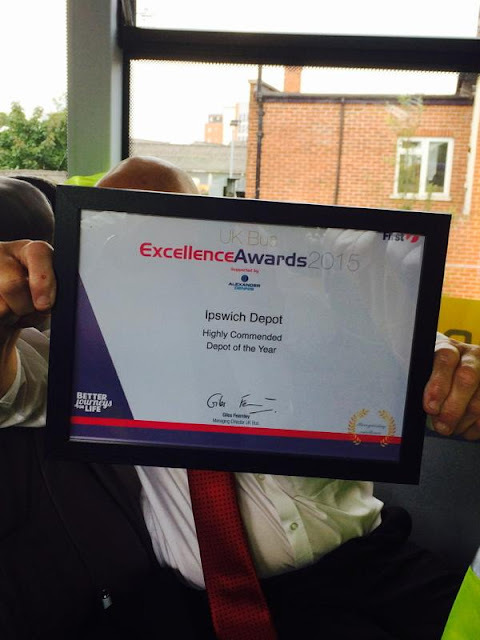 A rural depot doesn't just serve rural people it is STAFFED by rural people too. They also appreciate familarity and routine and hate change just as much. Anglian currently want to introdice a rolling roster. Now of course they are commonplace within big companies. I've worked on enough of them, but I have also worked set shifts and I much preferred that system. In London I swapped for one duty as much as I could. Obviously it had to be a duty people were happy to get rid of so my hours were pretty long, but getting to know regulars made the day go a lot quicker. Down in Maidstone there were drivers who did the same thing day in day out, and if I ever covered them would be inundated with questions as to where the regular driver was. Andrew Pursey knew this when he started expanding Anglian. Rather than familiarity breeding contempt Andrew knew, and still does that familiarity within country folk breeds loyalty and confidence. 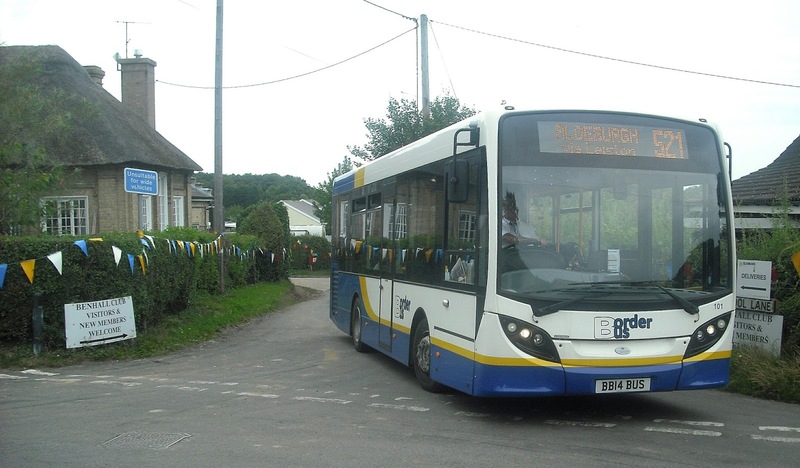 Did the good folk of Kessingland stick to Anglian when First re-introduced the 99 because they preferred gas buses? Of course not - they knew the drivers as they saw them on the same bus everyday and wanted to stick with them. Now Anglian want a system where no one will know which driver they are going to get from one day to another. That works in cities, where the nly thing people care about is the bus turning up, but as my emails show not in the sticks. I've never seen city drivers being given jars of homemade jam, or a bag of tomatoes freshly picked from the garden. I have out here. If Anglian go ahead (no pun intended) with their plan for rolling rotas it will alienate passengers and drivers alike. There are many drivers who are settled on a set duty - and let's face it - as long as they are reliable and turn up all the time that is a duty that doesn't have to be worried about. Anglian have had a big problems retaining drivers over the last 18 months and I fear this move will spark an exodus. Remember country folk are country folk regardless of if they are passengers or staff. The trouble is only country folk know this. Managers and directors living in cities have no idea of the mindset of country people - they are just nosey so-and-sos remember, and so assume no one gives a damn who drives their bus. Well they do. You only need to travel on the infrequent country routes to discover that. There are many aspects of a city depot that could easily be introduced to a rural depot - running numbers (carline), ticket machines able to receive messages for drivers, computerised filing/maintenance etc but when it comes to the people involved in a rural depot change them at your peril. If a country passenger is happy with a service they will organise their life around that service. If a driver is happy with his or her duty he will be reliable. If his or her passengers get on with a big smile and bag of tomatoes you have a happy driver. Alienate either party, and as is the case with country people you will never win them back. The next 3 months could be make or break for Anglian. I hope common sense prevails, as does the status quo. Maybe management at Go-ahead should remind themselves of the reasons they wanted to buy Anglian in the first place. This week I will be visiting one of my regular minibus drivers, who sadly had a heart attack last week. We have become good friends purely because he is a regular driver on regular days, and yes just the anticipation of having a good natter with him is enough to get me to book the bus sometimes on a day I wouldn't normally have gone out. He's going to be ok thank God, but off work for a few weeks. How many would notice if a First driver wasn't around for a few weeks? So are city and country the same? No. They couldn't be more different to each other, and failure to recognise that in a business sense could prove fatal. Yet another unscheduled post but there is enough happening everyday to warrant one. 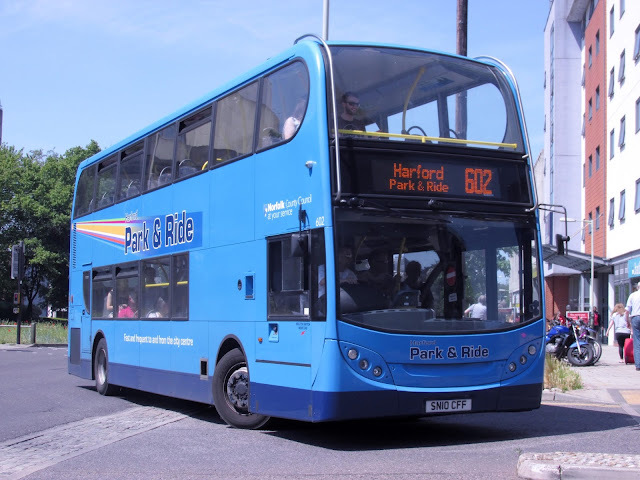 We start with the first vehicle to be painted into the new P&R livery for Norwich, and ironically it's on a vehicle that won't be coming into Norwich after the new services start on 7th September. Two of the Mercedes Bendibuses currently on the 604 will continue to run out of Costessey but will only run as far as Norfolk & Norwich Hospital on the 610. So there are only a couple of weeks to see 802 in Norwich in her new colours and as usual Cameron was in situ this morning to send us this picture of her. 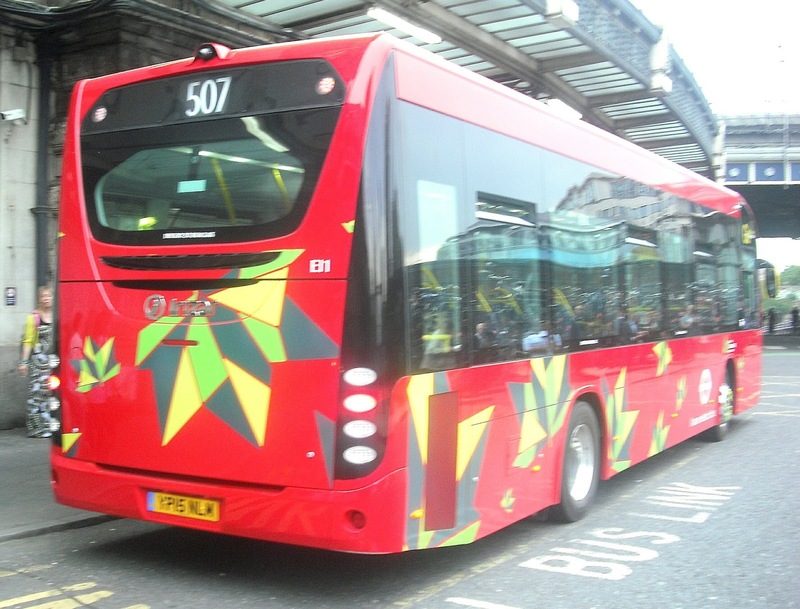 While on the subject of the 604's, yesterday I published Cameron's picture of 8 branded E400 608 on the 604 and I said it was the first decker I had ever seen on the route. Well needless to say there have been others, and I'm grateful to Sam Larke for sending in a couple of pics from his extensive archve of two deckers on the 604. 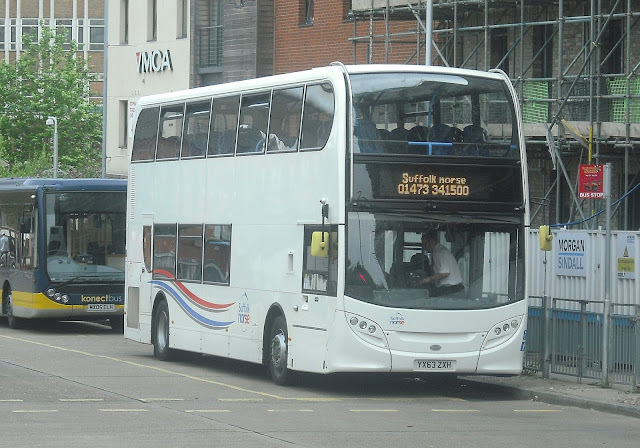 The first is of Loylne Trident 727 W827 WNJ and the second of more recent ex London Gemini 513 LB02 YXE. Many thanks, Sam. Incidentally Sam has more pics of the green bendibus, and you can see them on his Flickr page by clicking here. 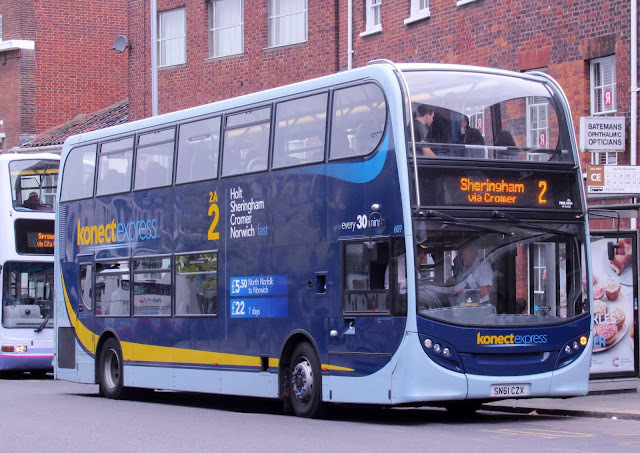 Two more of the old route 8 E400's have been rebranded and put out on the 2's. Once again Cameron who I think has taken root in Norwich supplies the pics. Finally tonight I can exclusively (there I said it) reveal that the first two Optare Versas have returned to Anglian from Konect. 308 and 309 AU11 EPF/E returned today, will have Anglian vinyls applied and be pressed into service very soon. 305/6/7 will follow shortly. My thanks to my Anglian contact for letting me know and Cameron for supplying the pic of 308. I had no intention whatsoever of posting today - deep cleaning my kitchen took priority, however I wasn't taking into account my wonderful contributors, Cameron in particular, who has sent me in 3 pics of the now former Konectexpress 8 E400's. The first is of the first vehicle to receive new branding for the 2, 606. While they are waiting their turn to be rebranded another two of the batch saw new routes. Following 605's appearance on the 17 from Dereham to Bradenham yesterday, today saw 609 on the 4's and most unusualy 608 on the Costessey Park & Ride 604. I've been dredging the memory banks and I can't ever recall seeing a decker on the 604 before. Normally the preserve of bendibuses it is Tempos that normally cover when there is a shortage of vehicles. My thanks to Cameron for being there to get those pics and for sharing them with us. Sounds better than oven cleaning! 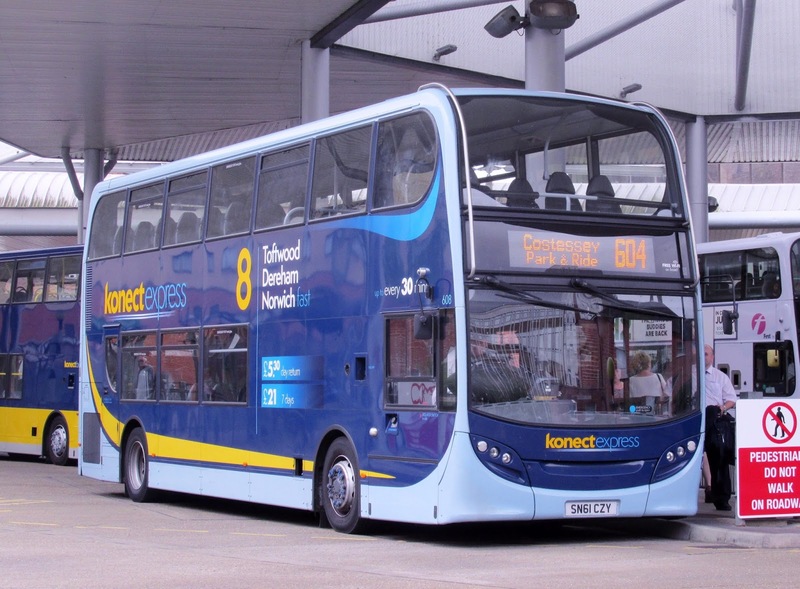 After much anticipation today saw the 5 new Enviro 400's purchased for Konect's flagship 8 service beween Toftwood and Norwich make their entrance. I've been up in Norwich for a few days waiting for them so as you would expect I made a trip to Dereham and back to test them out. First up was SK15 HKD - fleet number 620. I like the interiors of these E400's. I've always found fabric more welcoming than leather and the seats are firm but comfortable and the wood effect floors enhance the feeling of light. There is also no huge air chill unit above the stairs, which makes the seats behind the stairs far nicer to use. At the moment the buses are smooth, quiet and pretty rattle free, and one of the most noticeable things about these new E400's is they are faster. Going along the A47 the top speed was impressive and this will only help punctuality assuming that those dratted limiters don't find their way onto the vehicles. Another surprise was that on arrival at Dereham a cleaner got on to sweep the floors and litter pick before the next batch of passengers boarded. How long that will last is anyone's guess but it was a nice touch for the first day out. Now it has been known for sometime that the buses the new E400's are replacing are to be debranded then cascaded ont the 2's. However for one of them there was no rest today. 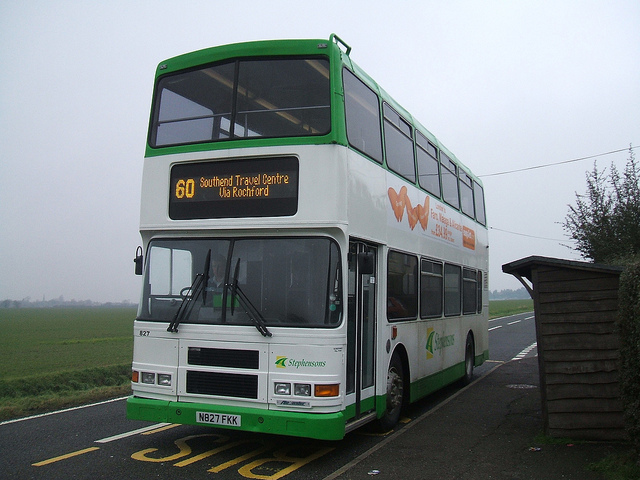 605 found itself on the 17, which operates twice a week between Dereham and Bradenham. I have only ever seen Solo's on this servce so I imagine the E400 turned some heads today. As 605 pulled away my attention was drawn to the fact that the new E400 was on the parallel road on the other side of the market. It's a long distance shot but the rears of old and new 8's can be seen for probably the only time in this picture. I understand that 606 was being debranded today and the rest will follow. It was then time to return to Norwich with 617 SK15 HKA our vehicle back, and I found this the better of the two I travelled on today. It certanly seemed more solid than HKD and it will be interesting to compare the two again in 6 months. Now the eagle-eyed among you wil have noticed a slight height difference between the old and new - certainly one of my companions did as he had to stoop quite markedly while walking upstairs. The low height of the E400's is shown quite well in this hurriedly taken pic of 618 SN15 HKB at Norwich Bus Station next to a Frst Gemini. I see no reason why those new E400's won't last the pace and do the job they have been bought for. They are perfectly adequate, but as always I'll compare them in 6 months time to see how they are lasting. There was one other E400 of note at Norwich today. Suffolk Norse E400 YN63 ZXH was operating the once a week 134 from Bury to Norwich via Thetford. During term time that service is normally coach operated. One last piece of housekeeping - Anglian's former Konect Trident 725 W825 WNJ has finally left Beccles and moved to Hedingham at Clacton. My thanks to my Anglian contact for letting me know this morning. Thanks to Cameron Robinson who disturbed Chris Speed's 5th Bacardi and Coke of the day whilst on holiday somewhere hot I can reveal what colour 66982, the latest vehicle to desert Ipswich for Norwich, is going to be painted in. I think most observers expected it to be painted Purple as its sister 66977 but no, 66982 is going to be painted up for the YELLOW Line. That came as quite a surprise as currently there are no single deckers liveried for the Yellow Line. So extra interest will be in evidence when she returns. I still have no access to my archives so once again I have raided Flickr and this pic of 66982 is by Hadliegh1849, whose Flickr page you can access here. My thanks to Cameron, and to Chris for giving permission to publish. A lot of tidying up to do this weekend and we start with one of many contributions from Cameron Robinson who, unlike me who honoured the start of the footy season by welding myself to the sofa, was out and about and getting one of the rare workings of the year so far. 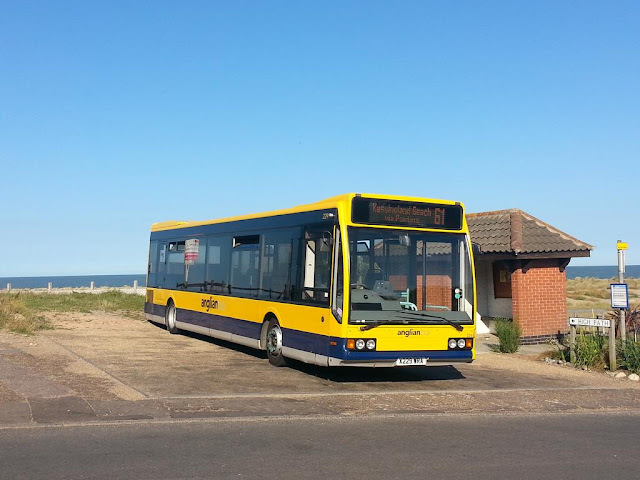 Soon to be retired Anglian Optare Excel 229 was pressed into service on the 61 to Kessingland Beach. This probably never to be repeated picture was the result. A transfer this week that caught everyone by surprise was Norwich Dart 42921 returning to its former home at Yarmouth on a permanent basis. I understand this is due to the imminent arrival of Ipswich B7rle 66982 but even so it was a surprise to all, especially as Norwich only recently repainted it themselves. Anyway she is back in Yarmouth and Cameron once again was in the right place at the right time. Another returnee to the area is Anglian Solo 907, which has been on loan at Chambers for a couple of years. Tuesday I saw her in Lowestoft on the 61A's. Another Solo to make my camera this week was one of Stagecoach Norfolk's new Optare Solo SR's, which entered service in the last few days. It was in use on the X29 on Friday, and after making a complete dogs dinner of my effort to picture it in St Stephen's St I finally caught up with it in Norwich Bus Station. 48022 YJ15 ANP is one of a batch of 5 SR's for Kngs Lynn and is named "Florence Ada Coxon". Now a bit of technical stuff. When I posted about BorderBus's loan E200 demonstrator which arrived on Monday (see here) I mentioned the reason it was there was to trial a new ZF gearbox which Alexander Dennis claimed to give substantial fuel savings. When I travelled on it it sounded and acted like any other E200, so I was surprised when I read that apparently it was a semi automatic box where the driver could change gear at will. I have driven many semi automatic buses and coaches over the years and one thing they all had in common was a gearstick! There is no gearstick on the demonstrator so some research was needed. I contacted Dave Marshall at BorderBus for some clarification. He told me that "It does have that (semi automatic) capability but not ideal to use as its actually a manual gearbox without having to use clutch ,therefore you basically drive it like a manual ie come off throttle as changing gear". Of course it would normally be driven in fully automatic mode anyway. 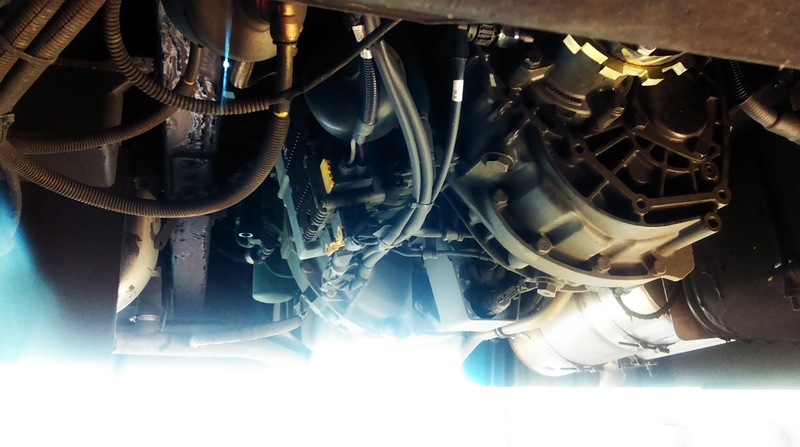 However it transpires that the gearbox wasn't working properly anyway, so some men in white coats have come down, fixed it, and BorderBus have got it for a further week so full and accurate evaluation can be made. Btw although advisable you don't have to come off the throttle when changing gear on a purpose built semi automatic box. For the real technophobes amongst you I have found this video on You Tube made by ZF, which explains and demonstrates the gearbox. Interesting that ZF and Alexander Dennis have different estimations for fuel savngs though. 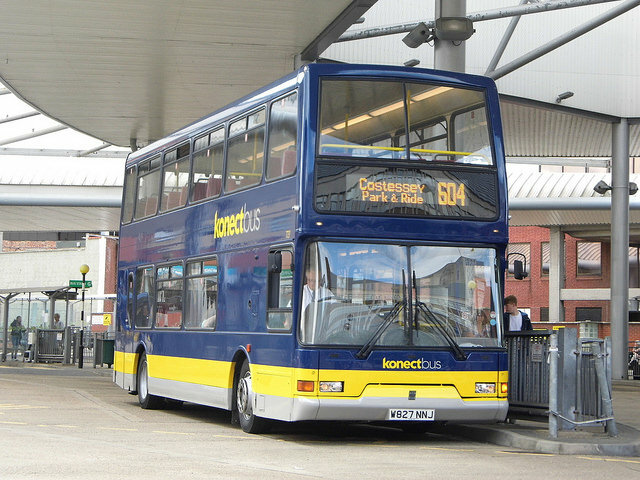 Ipswich Bus Blog has revealed that Ipswich Buses have withdrawn 3 of their East Lancs Darts. 91, 97 and 99, X91/9/199 XBJ have been taken out of service because of in 91's case serious mechanical failure, 97 is being cannibalised and 199's MOT has run out. All these vehicles are non DDA so would have had to be withdrawn at the end of the year anyway. I'm sure I have pics of these somewhere but I can't access my archives at present due to memory stick failure so you'll have to imagine them! Regular correspondent David Green from Galloway has informed me that Galloway have taken on long term loan an Olympian - yes Olympian from Stephenson's of Essex. N827 FKK is an ex Dublin Bus example. This pic was taken by Matthew Evans, whcse rather good Flickr page you can access here. I have yet to discover what route the Ollie is going to be used on - David if you can let me know I'll be grateful as it's a day out waiting to happen! I now have a plea to any transport and especially rail enthusiasts who are lucky enough to have a railway passing their back garden (or business even). I have become rather addicted to Railcam, which provides access to cctv cameras dotted throughout the country giving great views of railway lines, as well as providing diagrams showing realtime train information etc. It is perfect to watch those special trains you hear about but never get to see. There are also cameras on several heritage lines including the recently added Romney, Hythe & Dymchurch Railway in Kent. I invite you to take a look yourself at the railcam site by clicking here. -represented and it would be nice if this could change. Basically the requirements are you have a good view of the line from your property, you have an unlimited broadband package, and you don't mind hosting a camera. The railcam team will do the rest including advising on privacy laws etc. It would be wonderful if there could be a camera on the GEML, and right now a camera to get those majestic 37's between Norwich and Yarmouth I'm sure would prove very popular. So if you, or if anyone you know is in a position to help then either let me or the railcam team know. I do warn you they are addictive though! But when you see a steamer going over the Ribblehead Viaduct on the Settle - Carlisle line live from the comfort of your own sofa it's truly worth it! Now a picture that is going to becoe a rarity. In September First Ipswich finally launch their express service to Felixstowe. 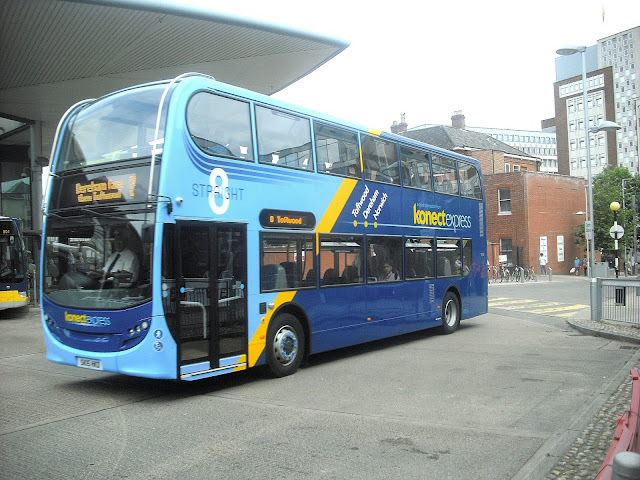 The X7 will go direct along the A14 and the two Volvo B7rle's painted up for the job last year, 69426/8 will be used. Therefore when I was lucky enough to catch 69426 to Saxmundham the other day I realised it might be a long time before I had that opportunity again. Even more of a collectors aspect to the pic is the 64A is being scrapped in September and the 64 will revert to running Ipswich - Aldeburgh, although not as frequently. A special post on that coming soon. So here is the picture, taken outside Tesco in Saxmundham. Finally for this rather big post I saw two sides to bus drivers this week. Two very contrasting sides. On one side we have the driver who stared into space through his wndscreen, refusing point blank to help an old lady who had dropped her pass while trying to board his bus with a shopping trolley, choosing to wait for a passenger (me) to help her and STILL refusing to make eye or verbal contact with anyone. The industry does not need drivers like him. Contrast that to the driver yesterday who turned conductor - musical conductor that is - leading his bus in a chorus of Happy Birthday to another elderly lady who is a regular passenger. The tragic irony is the second driver is paid less than the first. Life just isn't fair is it. Have a great week everyone. March 31st 2014 was the start of an era. 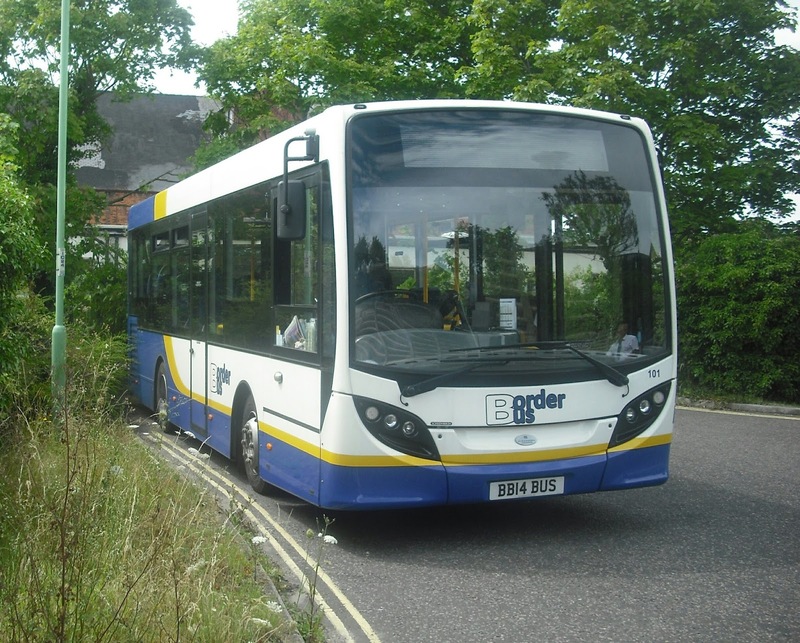 On that day BorderBus began operating the SCC sponsored 521 between Halesworth and Aldeburgh, which was their first service route. They bought a mini E200 for the service, which it has to be said I wasn't entirely complimentary about if you read my report from that day by clicking here. Since then I've barely been on the route although I see the bus almost everytime I go out. So since the legend that is Malcolm was taking a day off from the 146 and was behind the wheel of the 521 it seemed a good time to assess both the popularity of the route and how well the bus had lasted. I'm pleased to say both aspects get good reports. The bus had passengers on board near enough the entire time I was on it especially in the Aldeburgh/Thorpness areas thanks to the good weather, but also some regular shoppers going into Saxmundham and Halesworth. I said at the time the easy access aspect of the bus would go down well and that seems to have been the case. It is a popular and much needed route and for some people a vital link. Now the bus. In the 16 months it has been in service it has somehow clocked up 88,000 miles which is quite astonishing when you think it has spent its life trundling between Halesworth and Aldeburgh. I must also emphasise that the roads are not Suffolk's finest, and since everyone knows that E200's are rattling when they leave the factory and after 5,000 miles sound like a wedding car trailing a dozen tin cans, you will be expecting me to say you can hardly hear yourself think on it. Not so. Dave Marshall and Colin Stammers at BorderBus have worked miracles and the ratttles are no worse than they were when the bus entered service last year. That is some achievement and I didn't even notice the awful whine that annoyed me on its first day out. All in all the bus, route and passengers seem pretty happy and it was a very enjoyable few hours with Malcolm who put up with me like a true pro! Sometimes the bus Gods make sure timing is perfect, and today was one of those occasions. I thought it was about time I paid a visit to my mates at BorderBus now Lattitude had been and gone, so I sent a message announcing my intention to visit today and got the cryptic message back "ok, bring your camera". That, obviously got my interest roused and I spent the weekend trying to work out what it could be. I knew a few things were happening over the Summer but my bet was it was the E200 demonstrator that had been expected over Lattitude week but had to be postponed. I thought it was going to be an MMC but as it turns out those demonstrators won't be out for another 2 or 3 months. So after catching up on everything for an hour or so, at 1330 precisely what looked like a bog standard E200 rolled into Moor Business Park. So the obvious question is why is it here. BorderBus have 6 perfectly good E200's and know what they are like so why the need for a demonstrator. Well the answer lies within, so to speak. This E200 is fitted with a new ZF gearbox that Alexander Dennis claim can reduce fuel consumption by 20%. That is a lot. I feel able to say there is an amount of scepticism at this claim, which is why the bus is being trialed on the 146 this week to see if the figures back up the claims. In every other respect it is a bog standard E200, but of course it had to be put through its paces, so a party of us went out on a road test posing round Beccles winding up Anglian drivers waiting for their clapped out Streeetlites! Comfy seats, quiet for an E200 but the usual rattles that really shouldn't be on a bus with only 2,000 miles on the clock. It will be interesting to see how the trial goes with regard to fuel economy, and Andrew Pursey has promised to let me know the results of the trial for a follow up post next week. As usual I felt almost part of the team at BorderBus today, and it is always such a pleasure to pay a visit. I'll be up there a couple more times before the schools go back as I know there will be developments to report. In the meantime my thanks to Andrew, Dave M, Colin, Eric and Dave L for making me so welcome again, good to see you again Jamie, and special mention must go to Nicky Pursey for providing the taxi to beat all taxis to take me back to Beccles. POWER!!!!!! There are a lot of little things to get through today, with vehicle transfers, orders, repaints and engine transplants all going on. First of all something that was reported by David Green from Galloway last week (see comments on "Summer Break" post) is that an order has been placed for 2 new Optare Solo SR's, with a second hand one also making up the numbers. One can only assume this is for the 113/4 Diss/Ipswich service which Galloway take over next month. 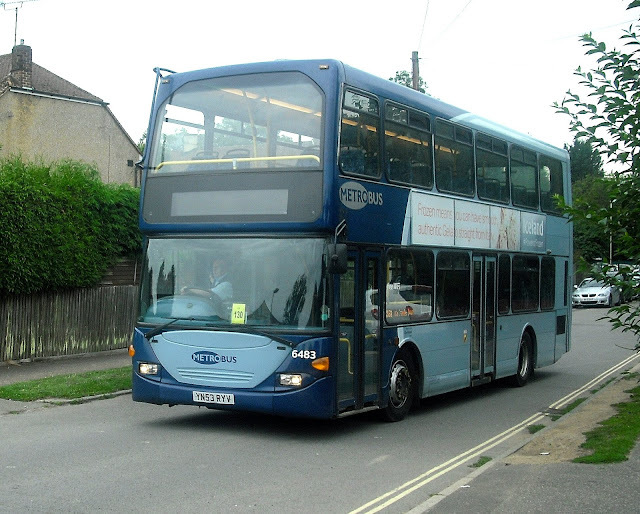 David also reports that a second hand double decker ex London has also been purchased - more details on that to follow. Many thanks, David for the continuing updates. Sticking to little buses serving Ipswich and with First taking over the 39 (renumbered 59) and 72 from Beestons it was decided that nothing at Ipswich was small enough for the routes so after flirting with the idea of Jersey Darts it was decided to tansfer two of Norwich's ex Lowestoft E200's. Sunday 45119 and 45928 went up to Rotherham to get the Ipswich treatment and refurbshment. That obviously leaves the quota for the tight 39 in Norwich two buses short so you'll be surpised to learn the E200's have been replaced by two yellow lines. No not Yellow Line buses (though nothing would surprise me) but the really tight spots on the route have had double yellow lines painted to enable bigger vehicles (probably Streetlites) to cope with the route. I look forward to updates from various travel sites telling me a 39 has got stuck because of an illegally parked car! Also on the move are Rotherham B10BLE loanees 60621 currently at Yarmouth and 66112 currently at Lowestoft, which are both moving to Norwich to cover repaints and presumably the two E200's. Other Lowestoft vehicles ALX400 30900 and Jersey Dart 43863 (formerly Yarmouth) are on loan to Yarmouth. This means a stay of execution to the last SLF Dart at Eastern Counties - 43466 at Lowestoft, which was earmarked for imminent withdrawal. 'Tis the season to be repainting, and I have three of the latest repaints for you to see, courtesy of my second pair of eyes (infinitely better than my own) otherwise known as Cameron Robinson. First up is the latest repaint by Sanders of former Anglian Scania YN03 UVM which used to be shrouded in an all over wrap for Sheringham postcards. This means everything owned by Sanders is now in Sanders livery. Secondly a pair of Konect vehicles that have been painted into standard Konect livery from their respective P&R liveries. First up is VDL Gemini 502, YJ05 PXC, previously seen in pink! Many thanks, Cameron for your invaluable contributions to the blog - couldn't do it without you buddy! I bumped into Cameron in Norwich on Friday and virtually frogmarched him to take a ride on newly refurbished First Norwich President 32100, her of the new seats that Cameron claimed to be really comfortable. Knowing that the sitting part of Cameron has to be composed of different chemical elements to that of normal people (he says B7L seats aren't hard) I was ready to force him to eat his words while we did a trip to Spixworth and back. However I can't. They are comfortable and a huge improvement on the old seats. The whole bus feels tightened up and is by far the best President in Norwich (in the name of all that's holy start putting rubber seals on the destination screen access doors) and I have a tip for anyone travelling on it - kick the yobs off the back seat upstairs and sit on that - luxury!! The best seats in the house, well the bus anyway! Earlier in the week I posted an update from Chris Jenkinson of Nu-Venture down in Kent reporting that former Norfolk Green Agoaline 898 needed an engine transplant using the engine from sister 897. I'm pleased to inform you that the surgery appears to have been a success and 898 now has a new heart. It is yet to be fully tested and Chris has promised to let me know when 898 is back on the road. 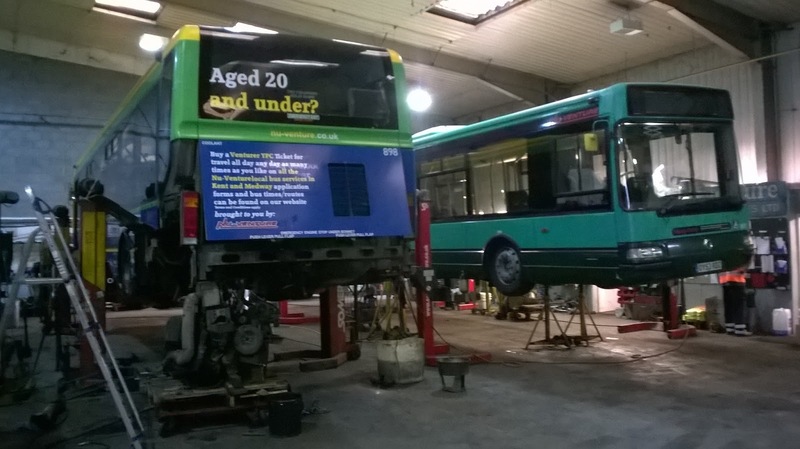 He has sent some pics of 898 undergoing the surgery which I'll use in a special when she's back on the road but here is a taster with 898 up on the ramps next to 891, which was being prepared for MOT, which I'm happy to announce she passed, so at least two Agoralines will still be going strong. Thanks, Chris - think I'll just call you Agoraman from now on! 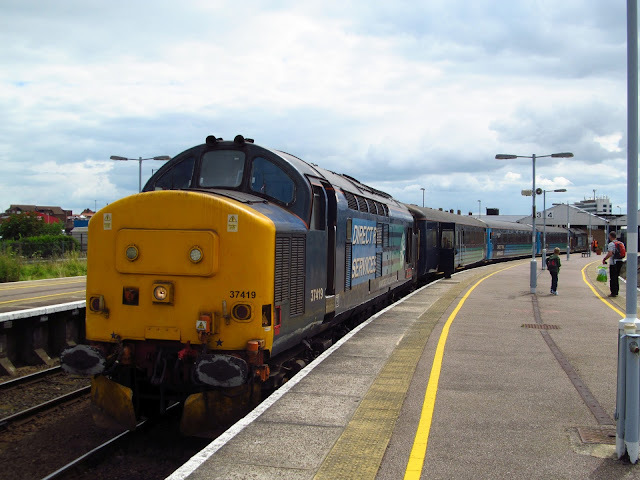 And finally Grahame Bessey (these Yarmouth bloggers are really nice people) has sent me pics he took at Yarmouth Station of East Anglian's noisiest celebrity since Alan Partridge hung up his microphone! The Short Set, or Loud Set as it's been nicknamed is attracting enthusiasts from far and wide and even people who don't normally give a train a second glance are paying close attention to it. A new loco for the set, 37419 replaced 37425 and here she is heading the set at Yarmouth. Many thanks, Grahame and hope you enjoyed the racket! Finaly finally a HUGE congratulations to First Ipswich depot for winning Highly Commended Depot of the Year at the First Group Excellence Awards. To Jose Mourhino I mean Chris Speed, Cliff Hussey, Barry Spurling, Steve Fountain, Joe Thorpe, Paulo van Kriekan and every driver, mechanic, supervisor and cleaner at First Ipswich well done - thoroughly deserved but a foregone conclusion after getting the Steve Award earlier in the year!